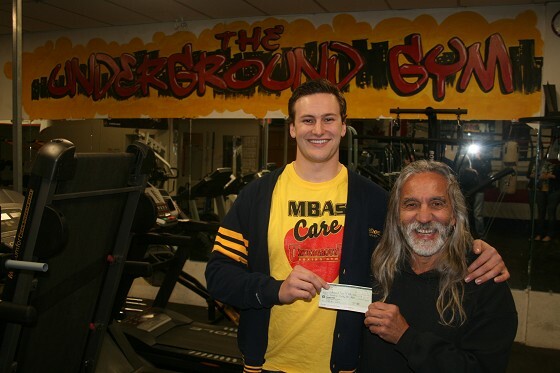 A scholarship from Mirabelli Corp. inspired Lakehead University student Jordan Cash to raise more than $1,000 for the Underground Gym in Thunder Bay. Cash, a Master of Business Administration student, had planned to volunteer at the gym as a boxing instructor but didn’t have time due to his busy school schedule. Instead, he raised money for the Underground Gym in a fundraiser called MBAs Care. “At the end of last semester I received a $200 scholarship from Mirabelli Corp. that I decided to donate to the Underground Gym, and I wanted to see if I could raise more,” Cash said. “I want people to know that Lakehead MBA students care about this community. We are proud to assist the Underground Gym to help young people reach their full potential,” Cash said. Peter Panetta, Underground Gym founder, said Cash’s donation will help keep the youth centre open. “This is huge for us. The timing couldn’t have been better,” Panetta said, adding that the donation will also provide food for the youth. “We usually have five or so fundraisers per year and they’re very important. These donations are much appreciated and much needed,” Panetta said. Cash raised the money through a scholarship from Mirabelli Corp., and donations from other MBA students and Lakehead faculty. Jordan Cash is a final year MBA student who will complete his studies this August. Peter Panetta, owner operator of the Underground Gym. “ We don’t have any core funding so this $1000 donation is huge for us. We have low overhead at the Underground Gym, but still have bills so that is where the funds will go. We will also use some of the funds for food for the kids.